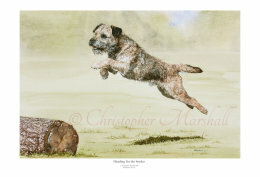 Christopher Marshall is a watercolour artist, specialising in dogs. Limited and open edition prints are available from this site and private commissions are undertaken. 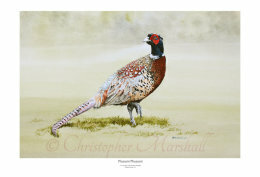 Chris is a watercolour artist, based in Somerset, with over 30 years of experience. Focusing initially on architecture, Chris turned his attention to animals and has now earned a reputation as one of the best artists in his field. His sympathetic style enables him to capture individual characters in great detail, bringing his subjects to life on the paper. Chris has exhibited his work all over the country at game fairs, agricultural shows and horse trials - to find him at a show near you, please see our events calendar for this year. Commission prices start from £1,000. The cost of a commission includes a visit from Chris to photograph the subject. contact page. You can also speak to Chris in person on his stand at one of the shows on our events calendar. 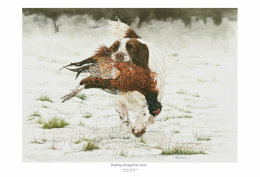 Examples of commission work and other images can be viewed across the website, but some of the finest examples are to be found on this page and in the Limited Edition Prints section. Content © 2018 Christopher Marshall, watercolour artist, based in Somerset.